NOTE: In this report, when the text refers to an event (e.g., a baptism) for which an associated document is available, a link will be provided to that document. If you see a word or words in bold text and underlined, just click on it. For example, in paragraph 1. A. you will see "He was baptized May 1, 1904." Click on "baptized" to see the document. To return to the main report, simply click the back arrow (usually in the upper left of your computer screen). A. Son Margarito Hernandez was born October 23, 1903. He was baptized May 1, 1904 in Terlingua by Father Brocardus from St. Joseph’s Catholic Church in Fort Davis. His godparents were Plutarco Martinez and Paula Mata. B. Son Eusebio Hernandez was born December 16, 1905. He was baptized February 24, 1907 in San Vicente by Father Brocardus. His godparents were Plutarco Martinez and Paula Mata. C. Son Jose Hernandez was born November 17, 1907. He was baptized in San Vicente April 26, 1908 by Father Brocardus. His godparents were Alejandro Rodriguez and Isidra Sanchez. D. Son Juan Hernandez was born August 21, 1910. He was baptized October 2, 1910 in San Vicente by Father Brocardus. His godparents were Venturo Bustos and Natividad de Marufo. A. Daughter Rosa Granado was born September 15, 1901 in San Carlos. She married Felix Garcia in Brewster County July 5, 1929. He was born circa 1905 in Terlingua, the son of Bernardino Garcia and Reynalda Enrique. In May 1933 he was working as a farmer, and in July 1935 as a mine laborer for Brewster Quicksilver Company in Study Butte. Felix died March 3, 1988 and Rosa died January 29, 1998. They both died in Grandfalls and are buried next to each other in Tamarisk Cemetery. (1) Son Porfirio Garcia was born May 5, 1930 in Terlingua. He was delivered by Dr. E.A. Montenyohl, Chisos Mining Company physician. (2) Daughter Enriqueta Garcia was born in Terlingua July 15, 1931. She was delivered by midwife Paula Salazar. In April 2002 she was living in Grandfalls, Texas. (3) Son Isidro Garcia was born in Terlingua May 15, 1933. He died in Odessa January 27, 1996. He was a resident of Crane, Texas when he died. (4) Daughter Anita Garcia was born July 4, 1935 in Terlingua. She was delivered by midwife Inez Garza. In November 2001 she was living in Grandfalls. She died in Ward County Memorial Hospital April 8, 2002 and is buried in Tamarisk Cemetery, Grandfalls. (5) Son Alberto Garcia was born July 8, 1937 in Terlingua. In November 2001 he was a resident of Grandfalls. He died in Medical Center Hospital, Odessa November 28, 2001 and is buried in the Tamarisk Cemetery. (6) Son Julian Garcia was born April 12, 1939 in Brewster County. In April 2002 he was living in Crane, Texas. a. Son Frankie Heredia and his wife Malissa were living in Crane in October 2001.
b. Son Edward Heredia and his wife Micaela were living in Crane in October 2001.
c. Son Roy Lee Heredia and his wife Ludy were living in Crane in October 2001.
d. Daughter Marivel Heredia married Salvador Marguia and they were living in Crane in October 2001.
e. Daughter Brenda Heredia married Jaime Sanchez and they were living in Crane in October 2001. B. Daughter Maria Granado was born November 4, 1903 in Chihuahua. She married Librado Cadena February 1. 1923 in Terlingua. They were married by Justice of the Peace Robert L. Cartledge. Librado was born in Coahuila, Mexico August 17, 1902, the son of Gregorio Cadena and Virginia Banda. Prior to his marriage he worked briefly for the Study Butte Mining Company in May and August 1918. He worked as a truck driver in 1930 and as a farmer in 1923, 11932. In July 1933 Librado was working for Brewster Quicksilver Consolidated in Study Butte and in 1934 and 1935 for the Chisos Mining Company, employee number 972. In October 1934 his foot was cut by a falling rock while he was working on the night shift. He missed work for 9 days as a result. In March 1935, while working the night shift in #9, his toe was mashed and he was off for 5 days. In April 1935 he hurt his foot on an ore bucket; it became infected and he missed work for two weeks. Librado died of tuberculosis in McKnight State TB Hospital in Tom Green County June 6, 1964. Maria died December 24, 1990. Both are buried in Tamarisk Cemetery, Grandfalls. a. Son Carlos Cadena. Jr. was living in Odessa September 11, 1998.
b. 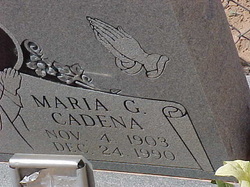 Daughter Guadalupe Cadena was living in Imperial, Texas September 11, 1998. Her married name is Rey. c. Daughter Christina Cadena was living in. Her married name is Ramirez. a. Daughter Maria de los Angeles Vasquez was born June 28, 1946 in Grandfalls. 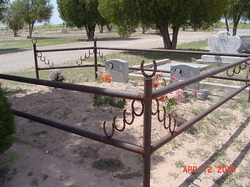 She died in Monahans February 17, 1949, probably of pneumonia, and is buried in Monahans Memorial Cemetery. c. Son Roberto Vasquez was born June 7, 1950 in Grandfalls and was living there in April 2012.
d. Daughter Hermelinda “Linda” Vasquez was born April 22, 1953 in Grandfalls. She married Mario Avila and in April 2012 she was living in Midland. e. Son Ruben C. Vasquez was born in Grandfalls September 1, 1955. He was living in Odessa in April 2012.
aa. Son Lee Roy Vasquez was born in Winkler County May 7, 1976.
aa. Daughter Annabelle Luna was born January 31, 1981 in Winkler County. bb. Daughter Bianca Leann Luna was born June 31, 1990 in Ector County. g. Son Roy Vasquez was born January 20, 1959 in Grandfalls and was living there in April 2012.
aa. Daughter Tonya Yvette Rodriguez was born in Ward County October 23, 1983.
bb. Daughter Ladonna Babette Rodriguez was born in Ward County December 20, 1984.
cc. Son Nicholas Jacob Rodriguez was born in Ector County August 9, 1990.
i. Daughter Celia Vasquez was born in Grandfalls December 27, 1960. She was living in Lovington, New Mexico in November 2001 and in Grandfalls in April 2012.
j. 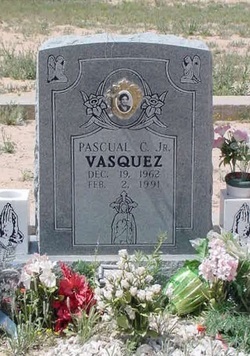 Son Pascual C. Vasquez, Jr. was born December 19, 1962. He died in Ward County February 2, 1991 and is buried in Tamarisk Cemetery. a. Son Arturo Cadena was born June 24, 1952 in Ward County. In April 2009 he and his wife Eufemia were living in Midland. b. Son Jose “Joe” Vega Cadena was born in Ward County March 19, 1955. He and his wife Robin were living in Glendale, Arizona in April 2009.
c. Daughter Viola Vega Cadena was born November 6, 1956 in Ward County. She married Al Almodova and in April 2009 they were living in Odessa. d. Daughter Carolina “Carol” Cadena was born May 11, 1958 in Ward County. She married Robert Garcia and in April 2009 they were living in Goodyear, Arizona. e. Son Daniel "Danny" Cadena was born in Midland June 21, 1964. He and his wife Cecilia were living in Midland in April 2009.
f. Son Ruel Cadena was born November 8, 1974 in Midland. a. Son Emiterio Cadena, Jr. was born January 3, 1956 in Ward County. (5) Son Donaciano Cadena was born September 6, 1932 in Terlingua. He was delivered by midwife Antonia Holguin. He died October 22, 1932 on the D. Ortega Farm, probably of whooping cough, He is buried in the Terlingua Cemetery. His box coffin was made by the Chisos Mining Company. a. Son Pedro Acosta was living in Grandfalls in July 2000.
b. Daughter Maria Acosta was born August 24, 1956 in Ward County. She was living in Odessa in July 2000. Her married name is Jordan. c. Son Roberto Acosta was born August 2, 1958 in Ward County. He was living in Odessa in July 2000.
d. Son Rafael Acosta was born July 16, 1960 in Ward County. He was living in LaPorte, Texas in July 2000.
e. Daughter Yolanda Acosta was born in Ward County November 3, 1964. She was living in Grandfalls in July 2000.
f. Son David Acosta was born in Ward County January 13, 1967. He was living in Grandfalls in July 2000.
g. Daughter Juanita Acosta was born June 1, 1971 in Ward County. She was living in Grandfalls in July 2000. Her married name is Brandenburg. (7) Daughter Lucia Cadena was born December 13, 1936 in Brewster County. In April 2009 she was living in Lubbock. Her married name is Prieto. a. Daughter Ofelia Cadena Dominguez was born January 25, 1963. She died of lung disease in Fort Stockton Memorial Hospital October 13, 1963 and is buried in Tamarisk Cemetery, Grandfalls. a. Daughter Olivia Dominguez was born August 14, 1964 in Ward County. b. Daughter Olga Dominguez was born October 4, 1965 in Ward County. c. Daughter Oralia Dominguez was born January 17, 1967 in Ward County. d. Daughter Ofelia Cadena Dominguez was born in Crane County April 13, 1971. 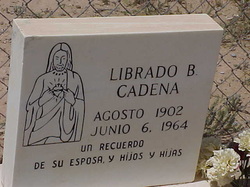 (9) Daughter Maria Magdalena Cadena was born May 29, 1941 in Brewster County. She died of bronchial pneumonia March 31, 1942 in Alpine and is buried in Alpine. a. Daughter Estela Cadena was born April 4, 1961 in Ward County. b. Daughter Delma Cadena was born August 16, 1962 in Ward County. c. Son Ruben Cadena was born October 8, 1963 in Ward County. d. Daughter Judy Cadena was born September 12, 1964 in Ward County. a. Daughter Belinda Kay Williams was born March 13, 1968 in Ward County. b. Son James Robert Williams, Jr. was born July 8, 1969 in Ward County. c. Daughter Wendy Kay Williams ws born October 6, 1972 in Winkler County. (1) Son Candelario Lopez was born February 2, 1925 in Terlingua. He was deceased by November 2008. (2) Daughter Melitona Lopez was born March 20, 1927 in Terlingua. Her married name was Palomino. She was deceased by November 2008. (3) Daughter Antonia Lopez was born September 2, 1929 in Terlingua. She was deceased by November 2008.
a. Son Guadalupe A. Lopez and his wife Helen were living in Carlsbad in November 2008.
b. Son Atanacio A. Lopez, Jr. and his wife Gail were living in Carlsbad in November 2008.
c. Son Jaime A. Lopez and his wife Susan were living in Artesia, New Mexico in November 2008.
d. Daughter Terry Lopez married Tony Ruiz. They were living in Loving in November 2008.
e. Daughter Sylvia Lopez married Margarito Carrillo. In November 2008 they were living in Carlsbad. f. Daughter Christy Lopez married Ralph Tavarez. In November 2008 they were living in Carlsbad. g. Son Danny A. Lopez was deceased by November 2008.
h. Son Richard A. Lopez was deceased by November 2008. (1) Daughter Cruz Vera was born in Terlingua May 3, 1933. E. Son Mauro Granado was born September 20, 1909. He was baptized in San Vicente October 2, 1910 by Father Brocardus. His godparents were Isidro Sanchez and his daughter Luz Sanchez. Mauro died in Loving, New Mexico in January 1976. F. Daughter Julia Granado was born in Terlingua December 20, 1911. On May 1, 1926 she married Juan Huerta, son of Francisco Huerta and Nolberta Valles. Juan was born in San Carlos, Chihuahua, Mexico in 1906. Julia and Juan were married by Father Julius Gremaud of St. Agnes Catholic Church in Terlingua. Their witnesses were Tiburcio Garcia and Teodora Granado. Julia was deceased by May 2000. G. Son Genovebo Granado was born February 21, 1901. On December 19, 1945 he married Felicita Maria Acosta, daughter of Jose Acosta and Antonia Ramirez. She died January 2, 1983 and is buried in the Imperial, Texas Cemetery. In May 2000 Genovebo was living in Imperial, and in November 2011 he was living in a nursing home in Crane, Texas. He died in Crane February 13, 2012 and is buried next to his wife in Imperial. H. Son Balbino Granado was born circa 1915 in Texas. Between 1934 and 1937 he worked for the Chisos Mining Company. On January 21, 1935 he injured his hand while working in the company coal mine. He married Juliana Cataño September 18, 1936 in Brewster County. They had four children, all of whom died as babies. Juliana died from complications of the births of the last two, who were twins. She is buried on the Valenzuela Ranch. (1) Son Francisco Granado was born prematurely June 4, 1937 in Big Bend, Texas and died the same day. He is buried in Big Bend. (2) Son Atanacio Granado was born May 2, 1939 in Study Butte. He died June 26, 1939 and was buried on the Valenzuela Ranch by his father. (3) Son Margarito Granado, twin of Balbino, was born prematurely in Terlingua June 10, 1940. He died June 27, 1940 and was buried on the Valenzuela Ranch by his father. (4) Son Balbino Granado, twin of Margarito, was born prematurely in Terlingua June 10, 1940. He died June 21, 1940 and was buried by his father on the Valenzuela Ranch. I. Daughter Manuela Granado was born July 22, 1916 in Terlingua. She was deceased by May 2000. J. Son Elojio Granado was born in January 1919 in Terlingua. He died January 23, 1931 and is buried on the Desiderio Ortega Farm. (1) Daughter Maria Belia Granado was born July 1, 1943 in Brewster County. She probably died as a child. (3) Daughter Marie Granado was born January 10, 1969 in Ward County. She was living in Los Angeles, California in May 2000. Her married name is Corella. (4) Son Oscar V. Granado was living in Loving, New Mexico in May 2000. (5) Son Adan V. Granado was living in Loving in May 2000. 3. Son Patricio Granado was born circa 1874 in Mexico. He married Placida Ramirez Baeza, daughter of Marcelo Baeza and Luciana Ramirez. She was born circa 1879 in Fort Stockton. (For more information on the Marcelo Baeza family, please see http://www.lifebeforetheruins.com/marcelo-baeza.html). Patricio and Placida lived in the Terlingua and San Vicente areas from 1904 until at least 1917. By 1921 they had moved to the village of San Antonio de los Alamos, Municipality of Ojinaga, Chihuahua, Mexico (southeast of the city of Ojinaga) and were still living in that area in 1930. They had eleven children and all except Eulalia were living with them in the San Antonio de los Alamos area in 1930. A. Daughter Eulalia Granado was born February 12, 1904 and was baptized by Father Brocardus in Terlingua May 1, 1904. Her godparents were Eusebio Galindo and Longina Salmon. B. Daughter Juana Granado was born in Texas May 23, 1905. She was baptized November 12, 1905 in San Vicente by Father Brocardus. Her godparents were Plutarco Martinez and Longina Salmon. C. Son Merced Granado was born in Texas September 16, 1906 and was baptized by Father Brocardus in San Vicente, Texas February 24, 1907. His godparents were Plutarco Martinez and Longina Salmon. D. Son Filomeno Granado was born in Texas December 20, 1908 and was baptized in San Vicente May 16, 1909. He died in Odessa May 24, 2000. E. Daughter Josefa Baeza Granado was born November 26, 1910 in Terlingua. F. Son Ladislao Granado was born circa 1914, probably in Brewster County. G. Daughter Inez Granado was born in the United States circa 1915, probably in Brewster County. H. Son Cresencio Granado was born in Brewster County April 19, 1917. In February 1970 he was living in Fort Stockton. I. Son Severiano Granado was born circa 1921 in the state of Chihuahua. J. Son Balbino Granado was born circa 1923 in the state of Chihuahua. K. Daughter Manuela was born circa 1925 in the state of Chihuahua. (1) Daughter Socorro Oyerbides was born in Fort Stockton June 1, 1928. (2) Son Fidel Oyerbides was born in Colorado City, Texas April 29, 1935. B. Daughter Manuela Oyerbides was born December 28, 1897 in Texas. In 1900 she was living in the San Vicente, Texas area with her parents. She was baptized in Terlingua September 14, 1902 by Father Brocardus. Her godparents were Teofilo Lujan and Rafaela Acosta. C. Daughter Margarita Oyerbides was born November 2, 1898 in Texas. She was baptized in Terlingua September 14, 1902 by Father Brocardus. Her godparents were Teofilo Lujan and Rafaela Acosta. D. Son Mariano Oyerbides was born July 2, 1900. He was baptized in Terlingua September 15, 1902 by Father Brocardus. His godparents were Juan A. Martinez and Rafaela Acosta. In 1920 he was living with his parents on Pyote and Grandfalls Road in Ward County, where he was working as a farm laborer on the home farm. In 1947 he was living in Monahans. He died there April 9, 1981. E. Daughter Maria Minerva Oyerbides was born January 2, 1902 in Terlingua and was baptized there by Father Brocardus September 15, 1902. Her godparents were Alberto and Tomasa De Leon. In 1920 she was living with her parents on Pyote and Grandfalls Road in Ward County, where she was working as a farm laborer. F. Daughter Eva Oyerbides was born in Terlingua December 31, 1903 and was baptized there by Father Brocardus May 1, 1904. Her godparents wee Eusebio Galindo and Petra Granado. She was living in Monahans when she died April 3, 1968. 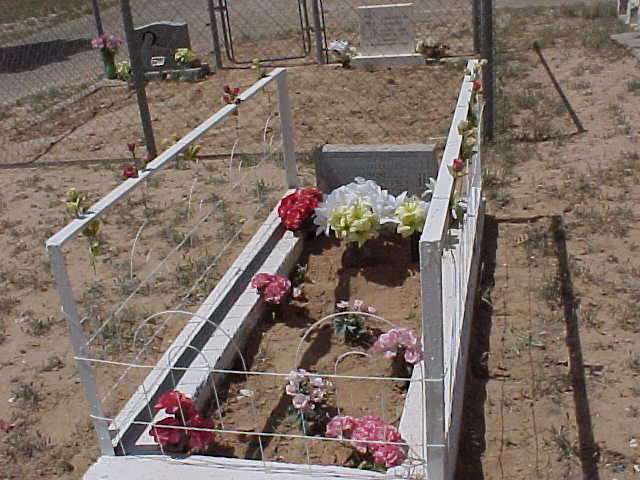 She is buried in the Monahans Memorial Cemetery. He married name was Jaquez. (1) Son Celestino E. Oyerbides was born in Ward County February 23, 1938. H. Daughter Andrea Oyerbides was born November 24, 1908. She was baptized in San Vicente, Texas May 16, 1909. Her godparents were Epifanio Salas and his wife, Juliana Leyva. A. Daughter Teodora Granado was born July 27, 1906 in San Vicente, Texas. She was baptized in San Vicente February 24, 1907 by Father Brocardus. Her godparents were Camilo Celaya and his wife, Ignacia Macias. She married Matilde Garcia January 6, 1928, He was the son of Jesus Garcia and Mariana Oliveres, Teodora and Matilde had eight children. For details and for more information on the Jesus Garcia family, please see http://www.lifebeforetheruins.com/jesus-garcia.html. B. Son Benigno Granado was born January 1, 1908 in San Vicente and was baptized there by Father Brocardus April 26, 1908. In May 1968 he was living in Colorado City, Texas. He died in Severance, Colorado in September 1980. (1) Son Raul was born in Brewster County January 13, 1937. In October 1999 he was living in Midland. a. Daughter Nancy G. Diaz was born April 12, 1957 in Midland. In October 1999 she was living in Odessa. Her married name is Garza. b. Son Manuel G. Diaz was born January 9, 1960 in Odessa and was still living there in October 1999.
c. Son Stanley Granado Diaz was born August 14, 1961 in Odessa and in October 1999 was living in Midland. d. Son Rudy Diaz was living in Odessa in October 1999. (3) Son Manuel Granado was born August 22, 1940 in Castolon. In March 1970 he was living in Odessa and in October 1999 he was living in Irving, Texas. D. Son Jose Granado was born May 9, 1914 in Brewster County and in May 1930 he was living with his parents in Santa Elena, Chihuahua, Mexico. In 1939 he was working as a cowboy when he suffered acute renal failure. He was taken to Alpine for treatment but died there February 1, 1939. He is buried near Castolon. (1) Daughter Maria Granado was living in Omaha, Nebraska in January 2002. (2) Daughter Ida Granado was living in Omaha, Nebraska in January 2002. (3) Son Joe Granado was living in Midland in January 2002. 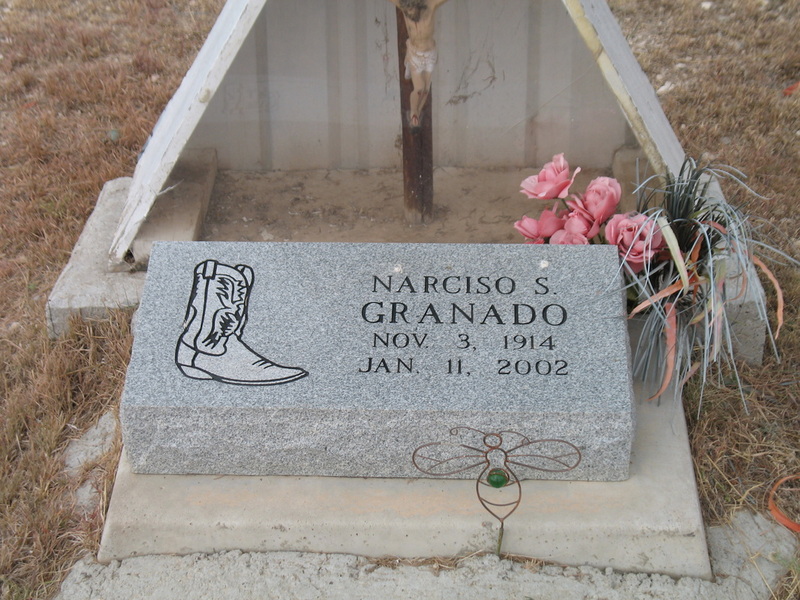 (4) Son Humberto Granado was living in Monahans, Texas in January 2002. (5) Son Jose Granado was living in Big Spring, Texas in January 2002. (6) Son Harvey Granado was living in Dallas in January 2002. H. Daughter Maria Jesus Granado was born circa 1921 in Chihuahua, Mexico, probably Santa Elena. In May 1930 she was living with her parents in Santa Elena, Mexico. In January 2002 she was living in Nogales, Sonora, Mexico. She was deceased by November 2004. Her married name was Varela. I. Daughter Tomasa Granado was born circa 1924 in Chihuahua, Mexico, probably Santa Elena. In May 1930 she was living with her parents in Santa Elena, Mexico. She was deceased by November 2004. Her married name was Romaro. J. Daughter Luz Granado was born circa 1926 in Chihuahua, Mexico, probably Santa Elena. In May 1930 she was living with her parents in Santa Elena, Mexico. In November 2004 she was living in Marathon. Her married name was Sanchez. K. Son Manuel Granado was born circa 1928, probably in Santa Elena, Chihuahua, Mexico and in May 1930 he was living there with his parents. (1) Son Eloy Granado Ortiz was born January 19, 1954 in Midland. (2) Son Arturo Ortiz was born October 26, 1956 in Midland. (3) Son Humberto Granado Ortiz was born January 15, 1959 in Midland. (4) Son Samuel Ortiz was born January 30, 1863 in Midland. M. Son Arturo Granado was born June 16, 1954 in Santa Elena, Chihuahua, Mexico. In November 2004 he was living in Midland. 6. Daughter Albina Granado was born in 1885. She married Candelario Baeza November 7, 1902. They had twelve children. For details and more information on the Baeza family, see http://www.lifebeforetheruins.com/marcelo-baeza.html. Marriage records from Jesus Nazareno Temple, Ojinaga, Chihuahua, Mexico, accessed via the FamilySearch web site. Baptism records from St. Joseph’s Catholic Church in Fort Davis, copies held by the Archives of the Big Bend, Sul Ross State University, Alpine, Texas. United States census records Brewster County for 1910, 1920 and 1930. Tamarisk Cemetery photographs from Ward County, Texas, web site. Brewster and Ward County birth records. Otilia Garcia Heredia obituary, USTexGenWeb Archives Project. Carlos Cadena obituary, USTexGenWeb Archives Project. Brewster, Ward, Mitchell and Tom Green county death records. Anita Garcia obituary, USTexGenWeb Archives Project. Chisos Mining Company records from the Peter Koch Collection, Archives of the Big Bend, Sul Ross State University, Alpine, Texas. Ignacia Acosta obituary, USTexGenWeb Archives Project. Marriage records from St. Agnes Catholic Church in Terlingua, microfilm of records available from the LDS Church. Copyright 2011 by Bob Wirt; all rights reserved.